Time for the Annual Missouri Auto Dealer Bond Renewal! 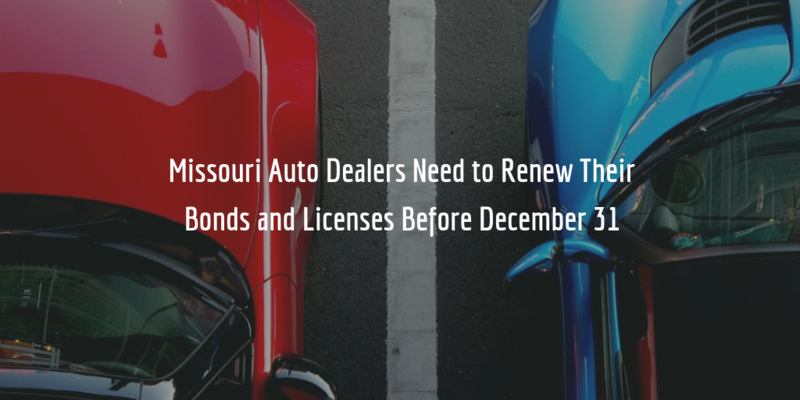 Missouri auto dealers have only a little time left for their license and bond renewal! All dealer licenses and license plates in the state expire on December 31. While this may seem far away, you would do best to renew as soon as possible, so as to avoid having to pay penalties, because there is no renewal ‘grace’ period in Missouri. Apply for a free no-obligations quote on your auto dealer bond renewal! Here is what you need to know about renewing your Missouri auto dealer bond and license at the Missouri Department of Revenue. Why do I need to renew my bond? Without renewing your auto dealer bond you cannot renew your license. According to Missouri Revised Statutes Section 301.560.1 dealers must furnish a $25,000 Missouri auto dealer bond upon applying for a license and remain licensed throughout the whole licensing year (which ends on December 31). Bonds that are submitted must either expire then or be “non-expiring” (continuous) bonds that are automatically extended until canceled. Continuous bonds do not require new documentation upon reaching their expiration date – they are renewed automatically, as long as the dealer pays their yearly premium. If you decide not to renew, the bond will expire of itself and you will lose your right to conduct business as a car dealer. When should I renew my Missouri auto dealer bond? Ideally, you should renew your bond as early as possible. If you obtain your bond with Lance Surety Bonds, we will notify you about your upcoming bond expiration as early as 90 days before its expiration and will continue reminding you of it in regular intervals thereafter. When we contact you with your renewal reminder we will also provide you with a quote on your yearly premium, based on your current personal credit score and other factors that we take into account. When renewing your bond you should also take into account the renewal deadlines for your license. While licenses officially expire on December 31, renewing your license on or after October 31 means you will need to pay a $25 late renewal penalty on top of your renewal fee. Renewing after December 31 will incur you a $50 late renewal penalty. Therefore renewing your bond and license earlier will save you the trouble of having to pay renewal penalties for your license. How much will my license and bond renewal cost? The yearly license renewal fee for motor vehicle dealers in Missouri is $150. To renew your license, check out the renewal application which features an extensive checklist with all the renewal requirements you need to cover. On top of that, you have to pay a yearly premium for your Missouri auto dealer bond renewal. That premium will depend on your current personal credit score and whether it has changed drastically (for good or bad) over the last year. Other factors that can influence your yearly premium are things like your financial statements, your personal assets and liquidity but also factors such as liens and judgments. To get a full picture of how surety bond companies determine your premium, have a look at our surety bond cost page. Want to renew your bond or get a quote? To renew your bond, or if you feel you might be paying too much for your current bond, just fill in our online surety bond application. We will then contact you with a free quote on your bond. If you already work with us, we will contact you well in advance and provide you with your bond quote per email as well. You can also renew your bond by following the steps outlined in the email. If you have any questions regarding the bond renewal in Missouri or other surety bond-related topics, contact us online or just give us a call at (877)-514-5146. Our experts will be happy to help!